plan to sell that extra capacity for contract distillation. We’re seeing more and more of these distilleries open, which is proving to be great for the nonproducing brands on the market. As more of these large distilleries are opening, we’re seeing a sizable amount of available capacity out on the market, which is going to drive the price a distillery can charge per barrel down, and make it hard to sell off all their capacity in the first place. Death’s Door is a perfect example of how it can be detrimental to the company if that extra capacity isn’t sold. SMALL-TO-MEDIUM DISTILLERY And finally, the small- to-medium-sized distillery. These are distilleries that are looking to do most of their sales at their facility by being a destination, experience, or existing in the midst of a popular tourist area. We’ve seen people who have done this model achieve great success. the smaller footprint. They’re succeeding in one market, and it’s generally bound by a property line. 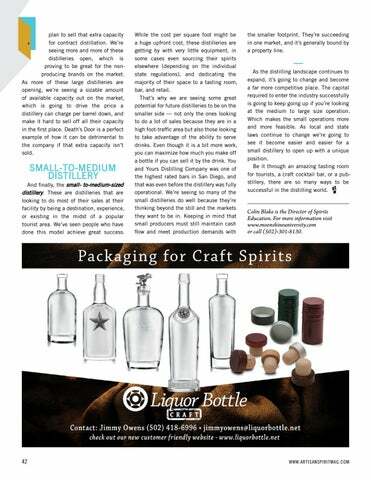 — As the distilling landscape continues to expand, it’s going to change and become a far more competitive place. The capital required to enter the industry successfully is going to keep going up if you’re looking at the medium to large size operation. Which makes the small operations more and more feasible. As local and state laws continue to change we’re going to see it become easier and easier for a small distillery to open up with a unique position. Be it through an amazing tasting room for tourists, a craft cocktail bar, or a pubstillery, there are so many ways to be successful in the distilling world. 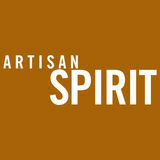 Colin Blake is the Director of Spirits Education. For more information visit www.moonshineuniversity.com or call (502)-301-8130.